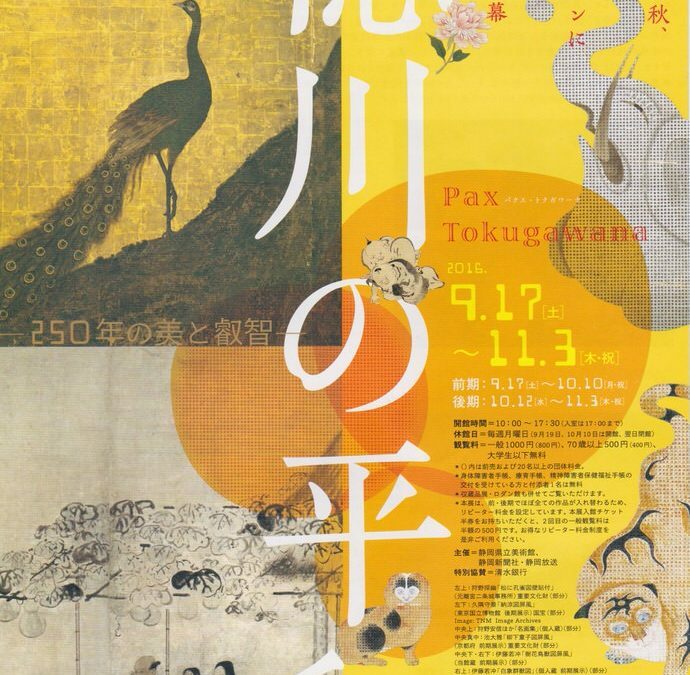 Pax Tokugawana was a wide-ranging exhibition. There was never a dull moment as we were swept through some of the Tokugawa (Edo) period’s best painted works. The exhibition was held at the Shizuoka Prefectural Museum of Art, a palatial, inviting space situated in the hills overlooking the university. It was a well-curated exhibition with grand scale folding screens and sliding doors displayed alongside intimate painted books and hand scrolls. The exhibition began with Kano Tanyu’s monumental peacock and pine tree doors from Nijo castle and many other fine works of the 17th-century Kano school. From there, the exhibition took us to Rakuchu Rakugai screens and scenes of merrymaking in the pleasure quarters. The figure painters, Hanabusa Itcho and Kusumi Morikage, faced each other in a fascinating room, as did Ike no Taiga and Yosa Buson in another. Works by So Shiseki and Shiba Kokan brought the foreign-influenced Nagasaki and Ranga schools into focus and rare paintings by Watanabe Kazan and Tsubaki Chinzan introduce Japanese portraiture. Tanyu’s Peacock and Pine doors are a dynamic early work, painted before the newfound peacefulness of the era had truly begun to establish itself. The doors epitomise the continuity of power and visitors could sense the position of the rulers. An eight-fold screen by Kano Toun Masunobu shows a Korean delegation visiting a shogun. While the Korean officials are dignified, their entourage is rambunctious, clamouring for a peek at the hidden shogun. Laughing, joking, even napping in the courtyard, their behaviour is directly at odds with the Japanese. A Kano Tsunenobu screen depicting a tea ceremony was one of the most delightful works in the show. The screen displays a delicate bamboo grove next to a meandering river. The unpretentious subject matter and the rustic design of the screen made it impossible to imagine a backdrop more appropriate for the tea-ceremony. A towering pair of Rakuchu Rakugai (Scenes in and around the Capital) screens by Sumiyoshi Gukei clearly showed the school’s strong ties to the Tosa school. Each scene was clearly delineated, encouraging the viewer to ‘read’ and identify each location. Hanabusa Itcho’s irrepressible sense of humour and affinity with depicting commoners was perfectly placed across from works by Kusumi Morikage. Morikage worked within the boundaries of accepted subject matter and compositions of the Kano school of the day, though within those confines he personalised the farmers and villagers that dwelled in them. Like Itcho, whose work he undoubtedly influenced, he was also delighted with depicting rainstorms. Interestingly, the Hanabusa Itcho screen (held in theTokyo National Museum), which is featured on the front cover of the exhibition catalogue, is almost identical to the Mary Griggs Burke screen, ‘Taking shelter from the rain’. At the time, I hoped they were a long-lost pair. Shiba Kokan and his contemporaries, the foremost artists in the tradition of Ranga (Dutch-style painting), were strongly represented. Beside them were a number of works by So Shiseki who drew his foreign inspiration from late-Ming Chinese bird and flower painting. Books presenting zoological studies of butterflies, parrots, and sharks were breathtakingly detailed. On the wall above was a magnificent hand scroll of butterflies by Mikuma Katen, demonstrating how these exacting studies had been transposed into artwork. It seems that Mikuma school artists, at least originally, didn’t exclusively paint cherry trees and blossoms. Much more was on view. Some were established masterpieces while many others were surprisingly new to me. However, they were all a feast for the eyes. It was an exceptional exhibition and one that ideally would have travelled to other museums.